Financial markets around the globe find themselves on post-holiday hangover. Stock markets from China to Europe and here in the US have all sold off in the first few days of 2016. Hopefully, 2016 is a better year than the forgettable 2015 for US stocks. But it’s looking like 2016 could be even worse than 2015. The S&P 500 finished 2015 with a loss. It wasn’t a big loss… but anytime stocks are flat for an entire year, the lost opportunity is damaging to investors. And right now, it looks like things are going to get worse before they get better. Simply put, the S&P 500 is in a downtrend. Stocks peaked midway through 2015. They sold off dramatically in August. Then they staged a dramatic rebound in October. And in November and December, they have set a series of lower highs and lower lows. The path of least resistance for US stocks is down. 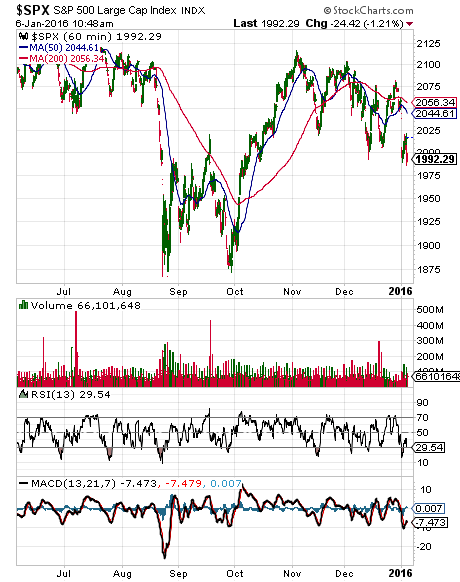 The MACD and RSI have reached levels that are indicative of an oversold market. We’ll likely see stocks rebound in the very short term. But they won’t break out of the downward trending price channel and will most likely continue moving lower. 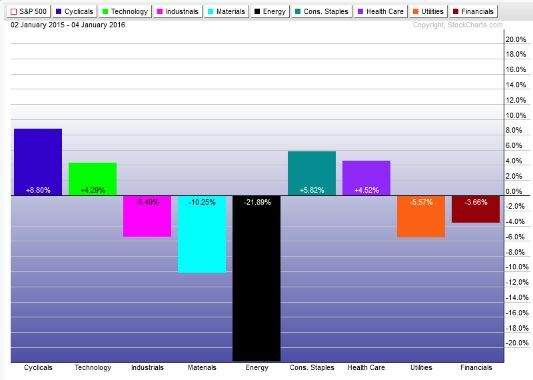 Four sectors finished with gains for the year… consumer cyclical, staples, healthcare, and technology. The other five sectors finished with losses, led by the 21.9% drop in energy stocks. Here’s the last decade of price action for the WTIC crude oil. The market has been led by a few mega-cap stocks while the vast majority of stocks are down or stuck in a rut. Investors are focused on the Fed that continues to signal they will raise rates to pump the brakes on an improving US economy and the threat of inflation. 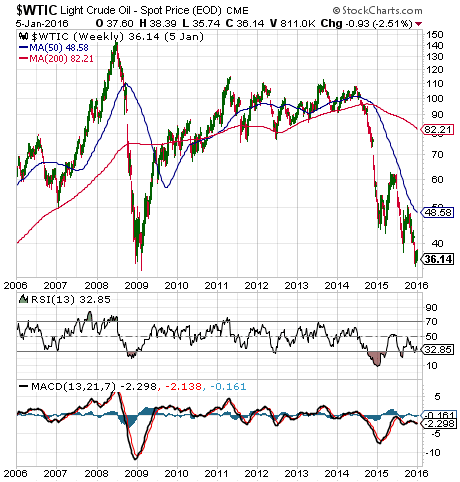 The strengthening US Dollar continues to be a major headwind for commodity prices, emerging markets, and companies that do a lot of business overseas. What’s more, China continues to be a thorn in the side of the global economy. Slowing economic activity and stock market turmoil could send China down the tubes if the government doesn’t continue to be a buyer of last resort. In short, get out of the way before this freight train runs you over.